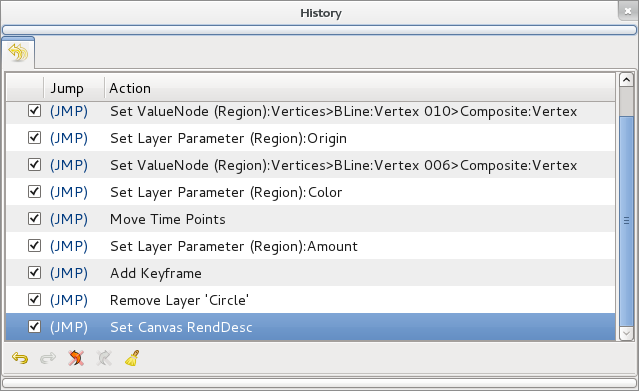 The history panel keeps track of all the actions that are made in Synfig Studio while editing a file. This history list is empty for a new clean file and also when the file already exists and is opened, so it is not saved with the file (is it worth to save it in the sifz file?). When a single user operation produces a lot of actions (typically when manipulating lots of Handles at the same time) all those common actions are grouped into a expandable one. See the small triangle in the image sample. By clicking on the small triangle you can expand the grouped actions and access them individually. The check box column is used to disable specific actions without having to go back through the entire actionlist. So if you want to redo or undo a specific action (or group of actions) just click on the check box. The "(JMP)" column is used to redo or undo all actions from the current situation to the action where you clicked on the "(JMP)" word. The "Undo" and "Redo" buttons undo or redo a single action each time they are pressed. Finally the "Clear Undo" and "Clear Redo" buttons clean the history list of "Undo" and "Redo" actions. The Clear Undo and Clear Redo actions cannot be undone.